When it was sold, the Nortel Portfolio included approximately 4,000 U.S. patents and patent applications, along with approximately 2,000 foreign patents and patent applications. After the purchase, the Rockstar Consortium began to distribute many patents from the Nortel Portfolio. At present, many patents and applications remain assigned to Rockstar Consortium entities, others are assigned to Rockstar Stakeholders, and some have been sold to third parties. In July 2013, seven patents in four families were sold to Spherix, an intellectual property licensing company, for an undisclosed amount of cash, $1 million in stock, and a share of future licensing income.2 Rockstar later sold 101 patents to Spherix in a subsequent transaction.3 These transactions may be a model for Rockstar’s future sales. In October 2013, the Rockstar Consortium began filing lawsuits. Rockstar Consortium entities have filed against Google, Samsung, and other companies for infringement of Rockstar patents. Rockstar is also involved in litigation with Charter Communications, Cable One, the Arris Group, Cisco, and others. Elysium Digital (“Elysium”) analyzed a snapshot of the U.S. patents and patent applications that made up the Rockstar Portfolio4 as of February 21, 2014. This report focuses on the U.S. patents and applications, and includes analysis of current assignments of patent and application assets, areas of technology covered, and timing of patent expiration dates. Elysium based its analysis on public data, including file histories, reassignment data, and patent text provided by the U.S. Patent and Trademark Office (“USPTO”). Elysium will update this report with additional analysis as more information becomes public. Elysium has also created an interactive online table, see below, that allows users to explore the Rockstar Portfolio. The table is powered by Legion, a patent research and collaboration tool. Elysium is currently performing an analysis of which patents in the Rockstar Portfolio are encumbered by FRAND obligations. Elysium is conducting this analysis based on public statements made by Nortel to standards bodies, as well as analysis of patent subject matter, timing, and inventorship. Elysium plans to expand and update this report once the FRAND analysis is complete. Rockstar Consortium entities own approximately 61% of these granted patents. 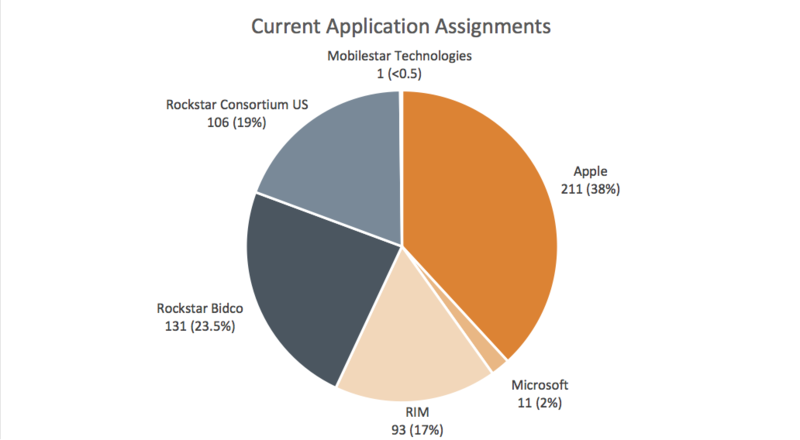 Rockstar Stakeholders own the remaining 39% of granted patents. 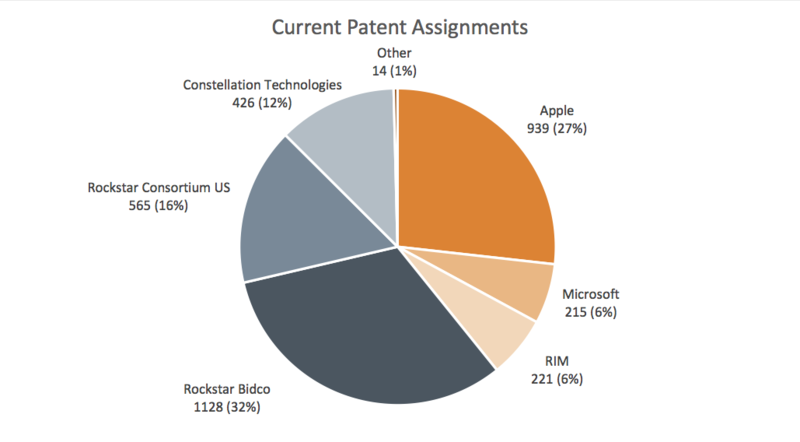 As the above figure shows, Rockstar Consortium entities own approximately 43% of these patent applications. Rockstar Stakeholders own the remaining 57% of patent applications. 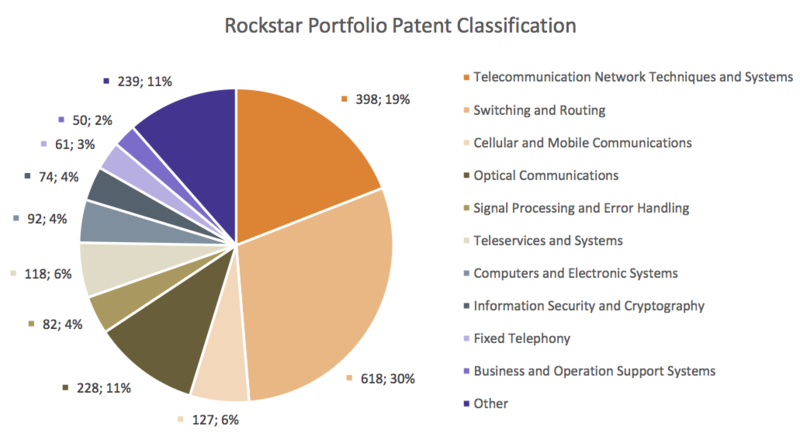 The patents in the Rockstar Portfolio span a variety of technological areas, as seen below. These categories were derived from the USPTO’s patent classification assignments. As would be expected from Nortel’s background, the Rockstar Portfolio is heavily weighted toward networking and telecommunications patents. There is an emphasis on packet routing, flow control, network configuration, and quality of service systems. This analysis is built into Elysium’s interactive online table, see below, which allows users to quickly filter the Rockstar Portfolio patents by the above classification categories and/or by user text input. Patents in the Rockstar Portfolio began issuing in 1992. Below are the projected expiration dates for the portfolio’s granted patents. Note that there are also approximately 553 pending U.S. patent applications in the Rockstar Portfolio that have not (yet) been granted. This data is current as of February 2014. Older patents in the Rockstar Portfolio began to expire in 2009. As of today, the majority of the portfolio’s patents have still not expired. However, as the graph above demonstrates, there will be a significant increase in expirations beginning in 2017. Expirations will then peak in the years 2019, 2020, and 2021, with more than 400 patents expiring in each of those calendar years. As visualized below, more than half of the currently issued patents are expected to expire by the end of 2021. 3Ari Levi, "Apple-Backed Consortium Sells 101 Patents to Spherix," Bloomberg, January 6, 2014 (http://www.bloomberg.com/news/2014-01-06/apple-backed-consortium-sells-101-patents-to-spherix.html). 4“Rockstar Portfolio,” in this report, refers to the patents and patent applications that originated from the Nortel portfolio and that are still owned by one of the Rockstar Consortium entities or by one of the Rockstar Stakeholders.